This breakfast is super easy! 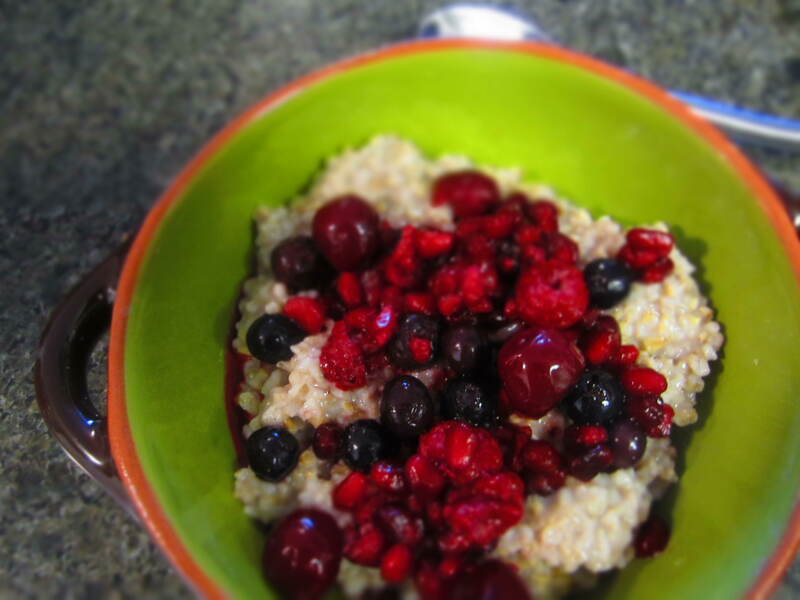 I love steel-cut oats they are loaded with vitamins and minerals(iron, magnesium, zinc and calcium…just to name a few!) they are also a good source of protein and fiber. I like to make a bigger batch of steel-cut oats in the beginning of the week so I have it on hand all ready to go. I just add some thawed organic fruit(this was a blend I got at Costco with blueberries, pomegranate seeds, cherries and blueberries) a bit of Psyllium husks for extra fiber and a sprinkling of Stevia for a calorie free all natural sweeter. If the oats are a little think just add a little Almond milk and they will be ready to go. You can also assemble the night before and take it on the go with you for a super quick and healthy meal.